The bride and groom were having a small intimate wedding and their reception was at a restaurant in Philadelphia, which had an eclectic and rustic decor. 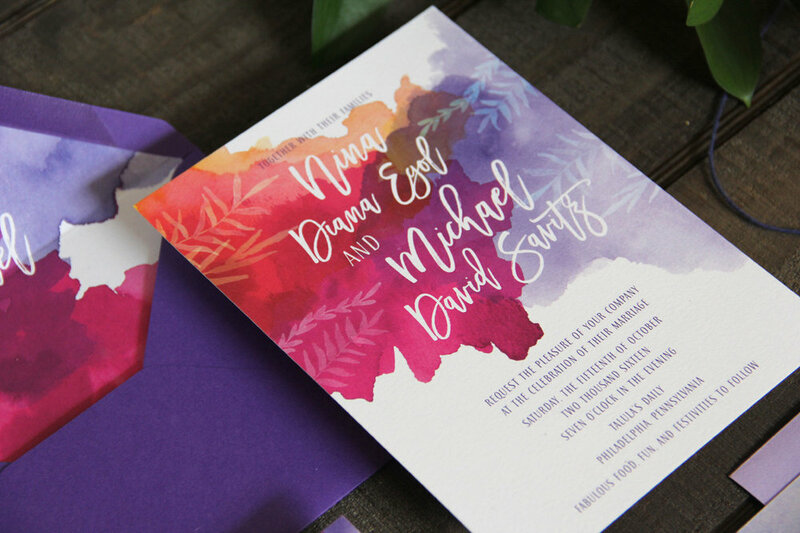 The couple envisioned a bright watercolor design paired with some natural elements for their wedding invitations in order to incorporate some of the venue’s style as well as the couple’s personality. So we hand-painted watercolor washes and paired them with some watercolor greenery. The invitation suite utilized inner and outer envelopes, in order to have an effective envelope liner on the inner envelope that would be visible to each guest. We mixed and matched envelope colors for the inner, outer, and reply envelopes to add more dimension to the entire suite. All of the pieces were tied together with a matching tag.